I know, I wore a black dress for Visible Monday two weeks ago, and here’s another. How many black dresses does one woman need? Just one more, is my motto. This black dress was found on eBay, and it’s another COS design, the Scandi-cool company that makes good quality basics. The dress is super-stretchy and fun to wear; I love how it narrows at the hem for a modern shape. It has the best pockets ever, nice and deep and at the perfect height. I’ll layer it over smooth tees on a cooler day, about seven months from now. 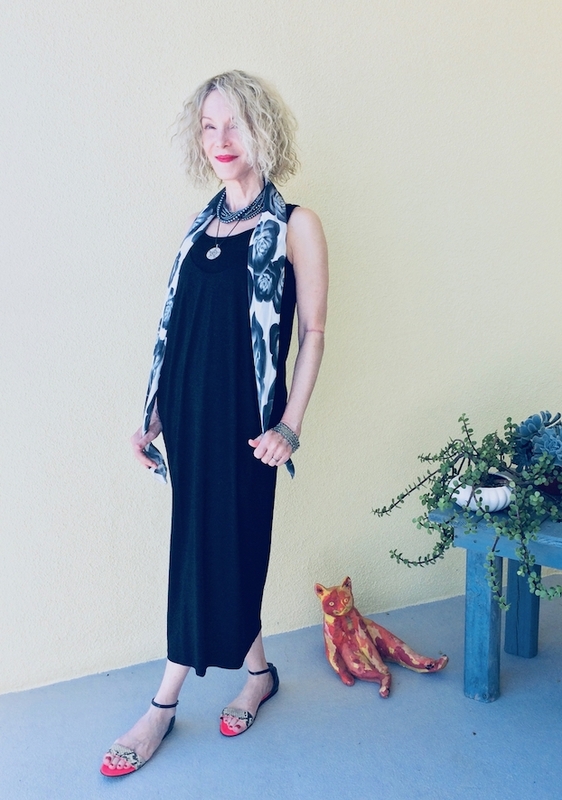 A thrifted black and white scarf is a fine finishing touch, with double silver-tone necklaces, and ankle-wrap flats. My elbow scar makes me look like a multi-piece GI Joe, only not as scary. The lipstick once again is “Dominate” by Laura Mercier, I think I love the name. And again, my hair is the Wiki by Ellen Wille. It’s one of my favorite wigs because the dark roots provide good contrast. Ahem, someone has borrowed my scarf. love the dress! never too many black dresses! Wonderful black dress! It really suits you! Gorgeous necklaces and hair that go so well with it. Love how easy breezy that dress is and if I could I would put pockets in all my dresses. Those sandals are superb! 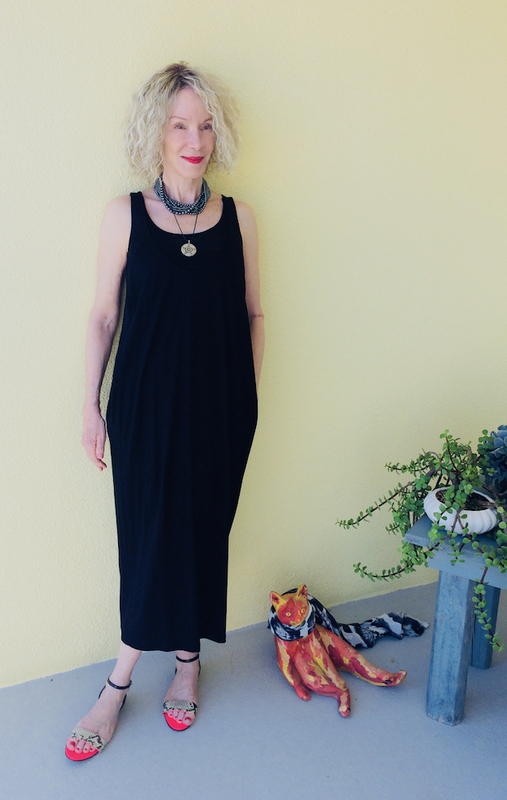 A sleeveless, comfy, black maxi is the best of summer casual to dressy flexibility. Great classic styling! sigh, its april and black dresses during the day are almost already unbearable for those of us in AZ. Love how your lipstick picks up the splash of colour on your shoes! thanks for hosting as always! Totally agree Patti , you can never have too many wearable black dresses. This one looks so very good on you and will be so versatile. Kitty wears your scarf well. Many thanks for hosting Visible Monday. Ha! One can never have too many black dresses! I say you can never have too many black dresses, especially when they’re from COS! Love this one too! You can’t go wrong with a simple black dress, such a versatile piece…and even better when it has pockets! It’s one of the holy grails of shopping, finding good quality basics in a style and price to suit. you look fabulous, gorgeous and elegant in your black dress and cool accessories!. Very visible indeed! I don’t know how I started following you. I think your blog showed up in a recommended reads list. I have to say, as a 58 year old woman, I love seeing your style. I will admit it. I like fashion and I like to be noticed. I like seeing how you are putting looks together. I appreciate that you give us brands and most of all, I love love love that you share that you are wearing a wig. I would like to know more about that. My mom has such thinning hair and I think I am going to probably go down that road as well. I would like to know about comfort. How hot are they? She gets headaches from some hats so maybe this would not be an option for her but maybe for me. I’ve had days when I just don’t want to take the time to deal with it and who doesn’t love to switch it up from time to time. Yes, there is always room for another black dress – especially one as fresh and flattering as this one! I love the length and shape, as well as how you have styled it. Patti you are too cute! The kitty cat looks quite pleased with the scarf. love the addition of a pretty printed scarf to a lovely dress. love the moto, something i can get behind with wine. clothes, etc. the pairing of the necklaces is lovely and your shoes add just the perfect bit of color. This is super chic. You’ll fit right in with that hip NYC crowd. I can never resist a great black dress, Patti! This one is so pretty and easy and chic and versatile. I love how you have styled it, too! Another fan of them. Black dresses are forever chic and create the perfect backdrop for accessories. Love that scarf btw. And the sandals with their little pop of pink are adorable. LBD are such a staple and you can never have too many! I love the easy style of yours and can see the versatility in it! Happy Monday! That is the perfect Summer black dress. And those sandals…yesss!! That’s a lovely black dress Patti. Love your sandals too with the pop of colour 🙂 Thanks for hosting. I love the shape of this dress on you, with the taper at the bottom. Really, a great line. And nothing wrong with black! The roots of this hair add sass to your Dominate.Thanks for the linkup. You have the affinity for black dresses just like a native New Yorker. I’m so glad that you are spending time here. That wig is fabulous, I also like the contrast. Now if you can just recover your scarf! I have a ton of black dresses of different sorts, too. Luckily, I read that it’s a good thing because there are so many different styles available. So I don’t worry about it. But now I want to start getting some little white dresses (or long ones, etc…) Lol! Black looks good on you Patti! The scarf, jewellery and sandals are great accessories for this dress. Well, it’s good to have a couple of these babies, because they are so versatile, Patti!! And I love how the kitty is accessorizing in the second photo!! You always look great in a black dress!! I need to try that lipstick! Love the look! This dress reminds me of Stephanie of O D Y S S E Y blog which ended a few years ago – do you remember it? Like you, she lived in Florida, but her style was very NYC. Nothing beats an all black dress – so versatile and looks good with all kinds of accessories! This look is so perfect for your Florida lifestyle! BTW, I’m headed to Cocoa Beach this weekend and plan to make a pit stop at Molly Mutt! Hoping I find some fabulous treasures! Dresses with pockets are the very best, aren’t they? This looks like a high-quality piece, and you look just stunning in it, Patti! I love your hairpiece – it really suits you! Thank you so much for hosting, as always! I’ll be along shortly in a firecracker of a dress! This looks really comfortable Patti. Something like this would be great for my holiday. I like the pop of pink on the shoes too. Have a great week. You can never have too many comfy dresses, black or not. You look very cool in this outfit. Happy Earth Day Patti-what a better way to celebrate that with pre-loved pieces which are perfect for each other. I think we all agree with you-Never too many black dresses! You can never have too many black dresses, especially when you look as good as you do in them. Adore the narrowing hem!